Can Petra Pull an Intel in Solar? It’s a solar panel. It’s a smart grid tool. Can a mashup between two hot technologies allow Petra to hit escape velocity? Petra Solar is one of the most misunderstood solar companies. Before meeting with CEO Shihab Kuran, I thought the company simply revolved around putting solar panels on top of telephone poles to cut out the real estate required to construct power plants. Another solar exec told me he thought the company sold smart grid equipment that sort of threw in the solar panel as an extra. New Jersey utility PSE&G has agreed to plant 40 megawatts' worth of SunWaves: approximately 72,000 of the 200,000 modules are already up. So far, the panels have survived wind, heat, blizzards and other natural hazards. They aren’t flying away like sails, according to Alberto Matos, vice president of renewables and energy solutions at PSE&G. 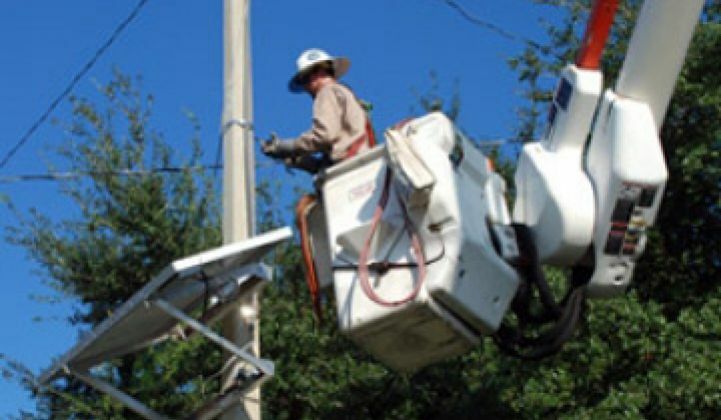 SDG&E has tested a few, and Petra hopes to announce more commercial contracts soon. 1. Land, permitting and transmission headaches disappear. The utility already owns the necessary easements and access to the grid is two feet away. Installation takes about 30 minutes. 2. The space exists. The U.S. has 300 million telephone and utility poles, according to Kuran. If you put solar on ten percent of them, the total would come to 10 gigawatts. That’s enough to satisfy the solar mandates in every state but California. 3. Variability is attenuated. The variable output from large solar farms can create headaches for utilities and the greater the number of solar farms, the bigger the headache. Putting independently functioning solar panels on thousands of telephone poles should multiply those headaches, yes? It turns out that the answer is no. Each panel only produces 225 watts. Power fluctuations don’t even amount to background noise. The power electronics in the system can also deliver power produced by the SEMs or discard it. Cloud cover is also lessened as a problem: few clouds are large enough to block two, or even three, panels at once. Even then, the microinverters allow them to operate independently. 4. But the big advantage comes in integration. With these modules, a utility installs a foundation for demand response services or voltage regulation at the same time. One truck roll, one component, two accomplishments. Sensing and smart grid communications, in fact, could become the lead selling point for the company. Adding intelligence to the grid, and particularly the last few miles of it, has just begun: sales of distribution automation equipment will grow from $2.3 billion to $5.6 billion by 2015, according to GTM Research. During a tour of Petra’s facilities, one person told me utilities asked far more questions about grid management than solar. Xtreme Power, which makes energy storage arrays wind and solar farms, says that its customers over time will likely reap more revenue from selling fallow capacity on the arrays to utilities for voltage regulation and peak power management than from selling electricity stored on the battery cells. But will utilities with smart grid efforts underway be interested? Sure, argues Kuran. A Petra network would give utilities a second, redundant network for security and/or backup. Integration has been a key pillar for Intel for years. Decades ago, the math co-processor got sucked into the processor by virtue of Moore’s Law. Then the memory controller and graphics chip got absorbed into the chipset. With ever integration, Intel cut the number of parts required to build a computer and thus lower the overall price. Intel, however, also saw its revenue increase. The integrated parts typically cost less to produce than two separate parts but could command higher, or at least stable, prices. Integration also allowed Intel to sneak into new markets. It failed at selling independent graphics chips in the late '90s. When it started to make chipsets with integrated graphics, it became the largest graphics chip maker in the world in a few years to the detriment of Nvidia and others. Gramps here might remember audio cards. With its integrated electronics, the SunWave module doesn’t compete directly against generic low-cost modules from China. It’s a smart grid tool! And, ideally, the combo package will be less than ordering a la carte. Ultimately, the SM is what I like to call a solar appliance, or a solar panel modified to fit a particular niche. Similarly, Cogenra, Chromasun and Entech, among others, have created hardware that merges solar thermal and PV panels. Soliant has a box that makes it easier to adopt concentrators. Petra’s combo platter is, arguably, one of the more attractive ideas out there because the two functions it brings together are currently in high demand. Chalk all this up to Moore’s Lite. The solar industry does not enjoy the dramatic changes in cost and performance chip makers experience with Moore’s Law. Nonetheless, enough similarities exist to give you something similar. 1. Cost. When PSE&G first signed the contract, Petra’s panels were slightly more expensive than standard ones. With the decline in panel prices, the equipment is perhaps around 30 percent more expensive, said Matos. Microinverters contribute to the higher costs too and, arguably, add the potential for more frequent maintenance. PSE&G however, has yet to bake in the savings from the lack of extra real estate, grading and construction required. The figures also don’t include the smart grid functionality: PSE&G is only now moving to tap into the additional intelligence. We will get more data in the future. 2. Challenging design cycles. The company’s intellectual property mostly revolves around the chips it has created for enabling smart grid functions. Semiconductor design has become more challenging and costly for startups in the nanoscale era: the number of venture-backed chip startups has withered in the last decade. 3. Competition. Other solar makers could figure this out. 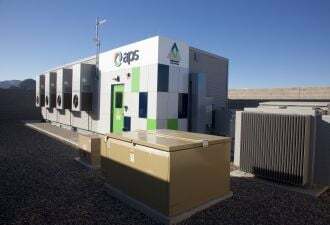 There is no shortage of microinverter manufacturers, DC optimizers and other outfits willing to team up with solar giants like BP to come out with similar products. Some, like Sharp, Samsung, LG and Panasonic/Sanyo, already employ a heck of a lot of chip designers and power electronics specialists to allow them to try to build something similar with their in-house panels. And would it be easier to plant panels like this on residential or commercial rooftops? One could argue that you’d get similar benefits but at a lower cost. Petra will have to run fast, but this could be an interesting race.